Did you know it is National Ice Cream month? Yup! I feel like we should really celebrate don’t you? 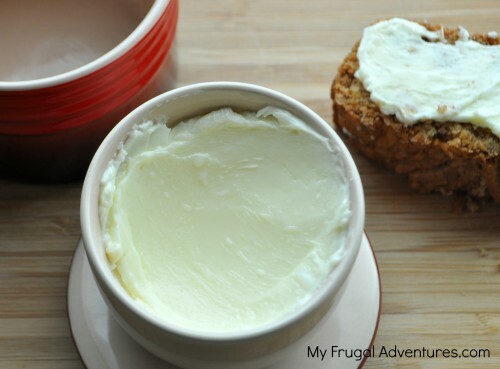 I have the simplest recipe for homemade ice cream for you. The best part is that you can totally customize this to any flavor you like- the base stays the same and the toppings can change. 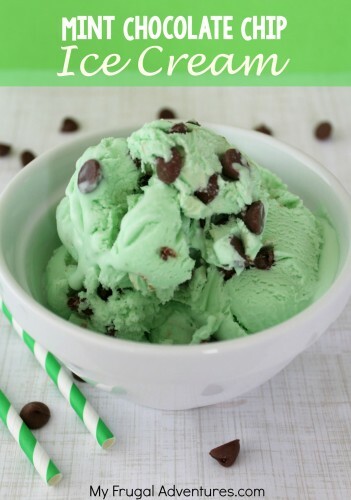 I went ahead and made Mint Chocolate Chip because that is one of my favorites. This seriously takes about 10 minutes to make and then several hours to harden in the freezer. So get your ice cream going in the morning and it will be ready for dessert that night! My Dad happens to love ice cream- he seriously eats it every night. I once got him a gourmet ice cream shipment as a gift with pints of exotic ice cream flavors. That was an expensive gift with shipping and such but he loved it. You could totally do the same thing with this easy recipe. Gift some pints to the neighbors and friends or come up with several fun flavors for an ice cream party this summer or whatever. This is a no bake dessert so it is way easier to make in summer than cupcakes or cookies. 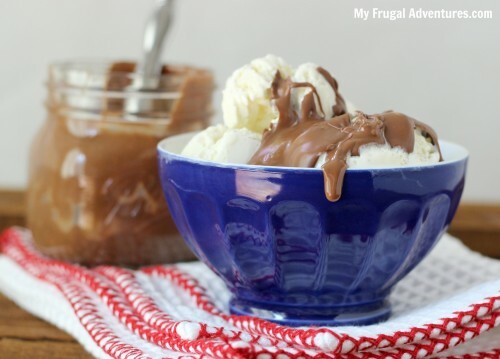 Homemade ice cream- no machine required! 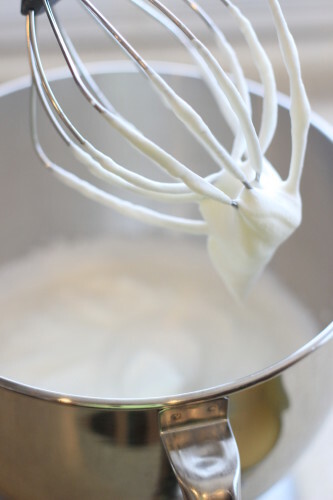 Place the 2 cups of whipping cream into a stand mixer bowl with the whisk attachment or in a large bowl for a hand mixer. Mix on medium low until it starts to get fluffy and then increase the speed to medium high. 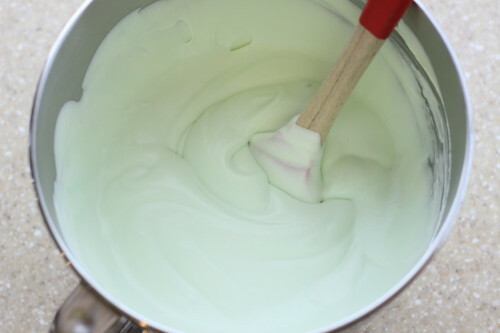 Mix until the cream is nice and fluffy with soft peaks like whipped cream. Do not overwhip or you will make butter. I like to add the food coloring when the cream is getting close to being done just so it is incorporated really well. I used 3 drops of green coloring for a light mint color but I suggest adding one drop at a time to see what you think. Once you have a light, creamy whipped cream, add the condensed milk and mint extract and mix just until incorporated. Taste the whipped cream mixture to be sure it is minty enough for you. If not add in a few drops more. Add your chocolate bar or chocolate chips and gently fold in. Pour into a standard loaf pan and cover tightly with saran wrap. Place in the freezer for at least 6 hours. I found this ice cream to be lightly and smooth and creamy- closer to a gelato than ice cream. 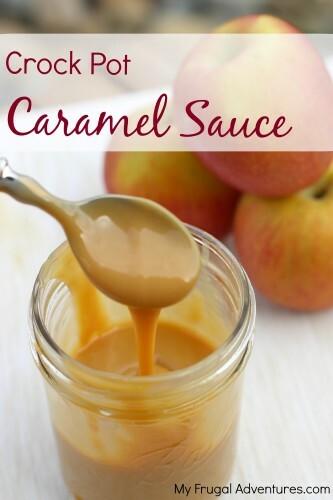 It was absolutely delicious and everyone in the family gave this recipe 2 thumbs up. Just be really careful you watch the whipping cream carefully as it goes from perfect fluffy creamy heaven to butter really quickly. So soft peaks because you have a tiny bit more mixing to go once you add the remaining ingredients. For the mint extract you can find that in the seasoning/spice section of most stores. Please be sure to get Mint and not Peppermint. Here is what it looks like– mine was about $3 at Target. Fruit Ice Cream (strawberry, blackberry etc..) – add either jam or add a fruit puree (make this by pureeing your fruit with a small amount of water so it is not too thick). You might want to run the puree through a fine mesh sieve to remove any seeds. And from there you can go crazy with crushed Oreos, chopped up candy bars like Reese’s, swirls of salted caramel and so much more! I hope you like this recipe. Please come back and let me know how it works for you and if you decide on any variations in flavors. I came across this kind of ice cream on YouTube n have made them many times. Favorite is: Nutella . Thanks for sharing mint choc.